Nathaniel Mendez-Laing has joined Cambridge United on loan from Posh. Peterborough United winger Nathaniel Mendez-Laing has today (February 18) joined local rivals Cambridge United on loan until the end of the season. 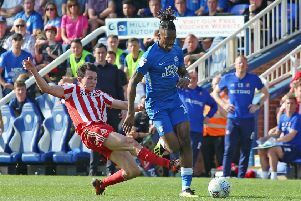 Mendez-Laing is out of contract at Posh at the end of the current campaign when he will be able to leave the club on a free transfer. Thee 22 year-old has failed to make much of an impact at Posh in two spells, initially on loan in the 2010-11 season and then as a permanent signing from the summer of 2012. Mendez-Laing has scored 12 goals for Posh in exactly 100 appearances, but 63 of those appearances have been as a substitute. Posh signed Mendez-Laing from Wolves. He’s also had loan spells at Portsmouth, Sheffield United and Shrewsbury.